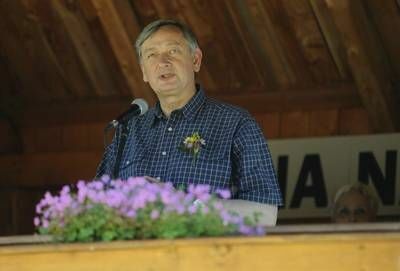 President Danilo Türk addressed on Saturday the 21th annual gathering under the Najevska lipa linden tree near Črna na Koroškem (N), emphasising the importance of dialogue in the joint efforts for a successful, effective and just state. The main tasks for Slovenians today are not always connected to the qualities, skills and will they have, but also to the readiness for dialogue and realistic assessment of problems, Türk said under the 780-year-old linden, often referred to as "the mother of Slovenian lindens". The president stressed that the warnings from some politicians that the Greek scenario is threatening Slovenia should be ignored as fabrication. "Slovenia has nice opportunities," he said, adding that these opportunities had to be worked on, also with better political dialogue. According to Türk, "with the skills we already possess, and with a better dialogue...we can create the state we want to have". In order to create a more just society, Slovenia needs a better rule of law, he added. Romana Lesjak, the mayor of Črna na Koroškem, pointed to the tradition of the meetings under the tree, which is a symbol of Slovenia. She regretted the fact that only a few high-ranking politicians attended the event, which attracted some 500 people. The first meeting under the ancient linden took place in August 1991, shortly after Slovenia gained independence, attracting the most important state representatives. According to the locals, the meeting had an aura of optimism and enthusiasm over the newly-established state. Legend has it that the tree was planted by the Turks during one of their invasions to mark a buried treasure. The ancient tree is 28 metres high and measures 11 metres in diameter, growing at the altitude of 1,056 metres above sea level.